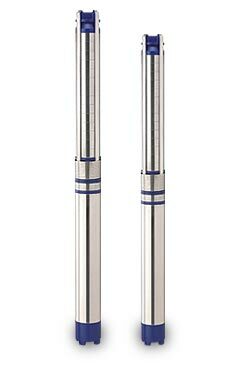 F-Tech's V5 Submersible Pumps are available in size up to 12.5 H.P. with flows upto 800 LPM. The V5 submersible pumps range is ideal where water requirements are substantial and expenditure on power a major consideration. Energy efficient radial and mixed flow models. Wear resistant high strength engineering polymer impellers and diffusers with stainless steel inserts. Both pump and motor are fully serviceable and utilize stainless steel, brass and noryl components for longer life. Rigid cast iron valve casing and inlet bracket. Domestic water supply to large residences and multi stories apartments. Water pumping from bores of diameter 4" (100 mm) and above. Public water supply schemes in urban and rural areas. Water supply to commercial establishments like hotels, lodging and hospitals. © 2011 F-Tech Engineering Co. All Rights Reserved.